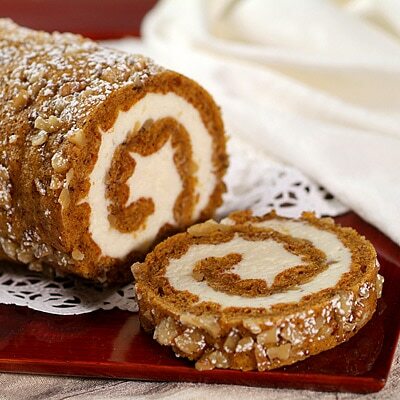 Try this "sensibly delicious" version of our pumpkin roll. Sprinkle with powdered sugar before serving, if desired. COMBINE flour, baking powder, baking soda, cinnamon, cloves and salt in small bowl. Beat eggs and SPLENDA® Sugar Blend for Baking in large mixer bowl until thick. Beat in pumpkin. Stir in flour mixture. Spread evenly into prepared pan. Sprinkle with nuts. BEAT cream cheese, 1 cup powdered sugar, butter and vanilla extract in small mixer bowl until smooth. Carefully unroll cake; remove towel. Spread cream cheese mixture over cake. Reroll cake. Wrap in plastic wrap and refrigerate at least one hour. Sprinkle with powdered sugar before serving, if desired. *Be sure to put enough powdered sugar on the towel when rolling up the cake so it will not stick.